ArtLibraryCrawl: And the Oscar goes to... me. And the Oscar goes to... me. I met my first oscar. And gave him a good pawing. Catching my eye in the Katherine Hepburn reading room was a pair of the distinctive gold statuettes. I was dared to try to remove them. They are bolted in with gusto. 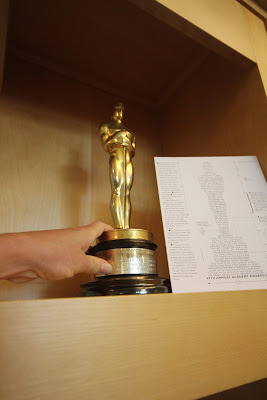 Art director on some of my favourite films (A Star is Born, Seven Year Itch) Lyle Wheeler's son wanted to donate his fathers Oscar, on the condition that the library would display it. He offered to design and build (he is also an art director) a unit for the display and security of the statuettes. With a variety of falsebottoms and bolts, you would have to dismantle the woodwork to free these guys. The library commissioned a second cabinet shelf for for Edith Head's Oscar. Ms Head was known for her work on seminal films like Vertigo, Sunset Boulevard, Roman Holiday and Double Indemnity- but her full list of credits is astonishing and awesome. Did that woman ever sleep? Her hard work obviously paid off not only in gold statues, but in call numbers. She is well represented in the Academy library with her papers and scrapbooks, in monographs (with titles like "..Hollywoods greatest costume designer" and "...a ranking of the most influential people in the history of film"), exhibition catalogues, dressmaking patterns. And of course, her dining room table. The awards show their wear, depending on the environment (and how many people paw at them, people like me I suppose.) It is gold plate- they are classy, but not solid-gold-classy… their value is not mineralogical.